I first read Casino Royale as an eleven-year-old. By then I’d feasted on all of the films and had read – or attempted to, at least – a bunch of the Fleming novels. At that time, I wasn’t aware that the films weren’t being released in order of the books; so Doctor No was my first experience with Fleming, followed by From Russia With Love and Goldfinger. And while I read these, joyfully for the most part, I missed the action and silliness of the films; where were the gadgets and the exaggerated action scenes? The car chases and the one-liners? It was James Bond that taught me the meaning of the word adaptation: that films based on books weren’t necessarily verbatim, and there was absolutely nothing wrong with that. Still, much as I enjoyed Fleming’s novels, as an eleven year old I didn’t appreciate their nuance, or quite comprehend how much of a product of their times they are. 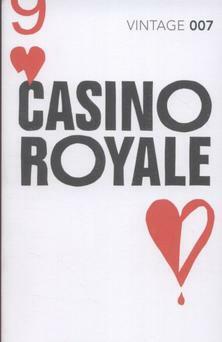 I have to admit, I must’ve skim-read several passages (particularly the gambling sequences in Casino Royale) in order to get to the action, which was plentiful, and while not quite as fanciful as the films, was certainly sufficient for my young mind. The ultimate test of a novel is of course the re-read; and I’ve read most of Fleming’s novels at least twice in my twenty-seven years on this planet. In fact, I’d say I’ve read my favourites perhaps half-a-dozen times. They’re only short books, after all. The point is: James Bond holds an important place in life. It was the films that inspired me to write my first ‘novel’ as a twelve year old, The Dependable Spy Agency, and lead to a lifetime of ingesting espionage fiction. Casino Royale remains one of my favourites. The plot is delightfully simple, and though the novel lacks the colourful villains Fleming’s later novels would be remembered for, it’s a stunningly succinct, but adrenaline-charged spy novel, with a last line that I’ll forever fondly recall as an all-time great. Le Chiffre is a SMERSH agent in financial strife, growing increasingly desperate to reclaim his lost funds: so much so that’s he’s willing to put it all down to a game of cards. Enter MI6’s best card player, James Bond, agent 007, who very quickly discovers there’s more than just money on the line; and whose partners, Vesper Lynd and Rene Mathis, may have ulterior masters. Bond is taciturn and brutal. Women are playthings, distractions for when the job is done, never during: very much a product of the time, with a mentality that would be immediately quashed in today’s world. He’s not likable, but we respect him because he’ll do whatever it takes to get the job done; whereas Connery and Moore’s Bond’s, as capable as they were, always had a softer edge in my mind – though their lovers were just as disposable. I didn’t understand it as an eleven-year-old, but now I understand: Bond is a spy who has been through the war, who has earned Double-O status because of two successful assassinations; one clean, the other dirty, an up-close job. He is not necessarily naturally callous; but it’s a temperament he had to create for himself in order to do the job. I often wonder if Bond despises what he’s become for Queen and Country – but it’s rarely examined by Fleming (and had he done so, the 007 novels would’ve been very different beasts). In comparison to later plots and villains, Casino Royale is a very modest beginning to the long-running 007 series. It remains, to this day, a distinguished spy novel.